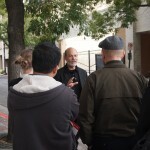 When Mark Morris, landscape architect and UCFA board member, organized lunch time tours of downtown Salt Lake for Design Week, he wondered who would show up. Design Week, held the last week of October, brings together different types of designers but its goal is to highlight the importance of design to the public. 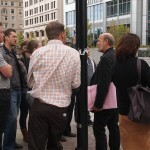 The brown bag walking tours were a first for Design Week and each highlighted a different aspect of Salt Lake City’s downtown: City Creek, iconic plazas and landscapes, architecture preservation, public art; and the walkable downtown. 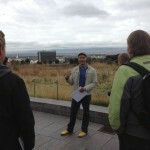 Bad weather forced the cancellation of two tours but the rest drew from 15-20, and many more for Walkable Salt Lake. As expected, designers and students attended, but also members of the public who were simply curious about Salt Lake’s built environment. Mark allowed those who volunteered to lead tours to shape them based on their own expertise and interests, and each reflected those passions. Stephen Goldsmith’s tour, “City Creek and the Evolution of the City” was as much about lost opportunities as successes, and raised questions about public life in the private square. 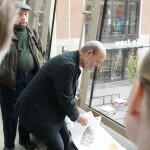 Mark Morris’ tour underscored the unique contributions of landscape architects to the quality of our urban life: from urban planning and design, to plaza and park design, to green roofs. 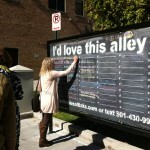 Molly Robinson, urban designer for Salt Lake City, excited people about the potential of Salt Lake’s mid-block “laneways” and alleys to enrich downtown life and walkability. About 80 people, including many students, attended this tour (if you want to add to that conversation: http://www.walkablesaltlake.com). 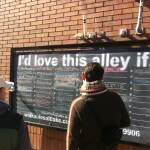 The Utah Center for Architecture hopes to create consistent downtown tour opportunities for the public during warmer weather months. 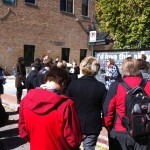 Stephen Goldsmith begins tour on Regent St.
Utah Architects Project Expanded and Enhanced!